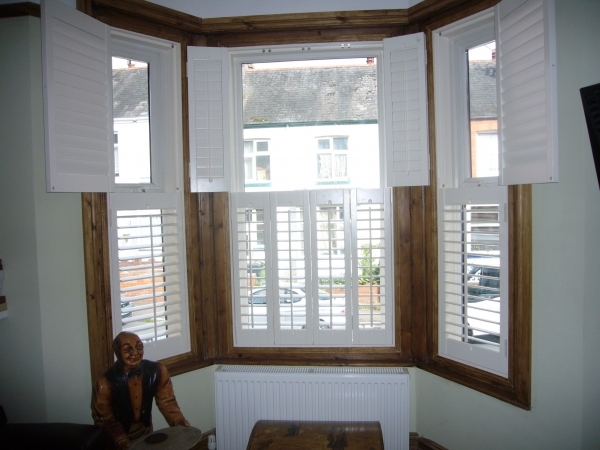 Shutterly Fabulous based in Brighton and Hove have supplied many seaside homes with wooden plantation shutters. They look modern and clean and really add to that seaside feel. Brighton and Hove is inundated with beautiful Edwardian Buildings, and these two homes in Pembroke Crescent, Hove is a fantastic example of old style meeting modern, with their newly fitted wooden shutters. Expertly designed wooden shutters work incredibly well with bay windows, they allow rooms to feel more spacious, letting in lots of light yet retaining your homes privacy. You can see in these two Hove Edwardian style homes that they have both chosen different styles of wood shutter for their identical bays and they both work incredibly well with the styling of the house. Many shutter companies won’t come out to you to measure and give you a firm quote without certainty of your order. We think this is crazy and we offer a no obligation measure and quote service. Shutterly Fabulous wood shutters are an investment and you need to be sure you are working with an expert shutters company, who will deliver the best possible design, product and wooden shutter installation. Shutterly Fabulous recognise the investment you are making in selecting the right partner for your wood shutters. To get started with enquiring about shutters for your home, why not request a Shutterly Fabulous brochure, or get in touch with our team with your rough dimensions for a quote.